Holland Park is a vast space of plants, trees and grass. Dogs can be seen going for walks or running triumphantly around the grass, small cafés are filled with people sipping from their coffee cups. Located a fifteen minute walk from Notting Hill Gate, or one tube stop up on the Central Line, the park is home to families enjoying picnics. The one thing that took me by surprise was the peacocks. Peacocks wander around the park freely amidst the families and dogs. They cry out to one another - a beautiful sound among the trees – and continue with their business, ignoring those around them. The park had statues, ponds and fountains and giant human-sized chess boards. The sound of a live opera show could be heard in the distance, somewhere else in the park. Before I even saw a peacock I could hear one crying out, it wasn't far, somewhere just around the corner. I followed the sound trying to find this marvellous creature but after walking around a building in a circle I realized I couldn't see him. Then he cried out again, and I looked up. He was standing over the building looking down at everyone passing. He cried again and somewhere far off another replied. I followed the sound again when a teenage boy came running, flapping his arms and screeching the sound of these birds, trying, and failing, to imitate their sound. Located in the car park was another peacock. Walking effortlessly between the cars and stopping to check an empty GBK bag. I followed the bird around and getting close to him, he didn't seem to mind. He decided to move out of the car park and out into the street. He moved down the street and past the houses. Families drove past in cars and the children could be seen giggling and pointing to their window; amazed by the animal. The peacock continued down the street until a lady walking up decided to try and persuade him to go back, he followed her as she waved her arms. She got him back inside and I watched as he waddled up towards the GBK bag once more, hoping that someone might have finally left something for him. 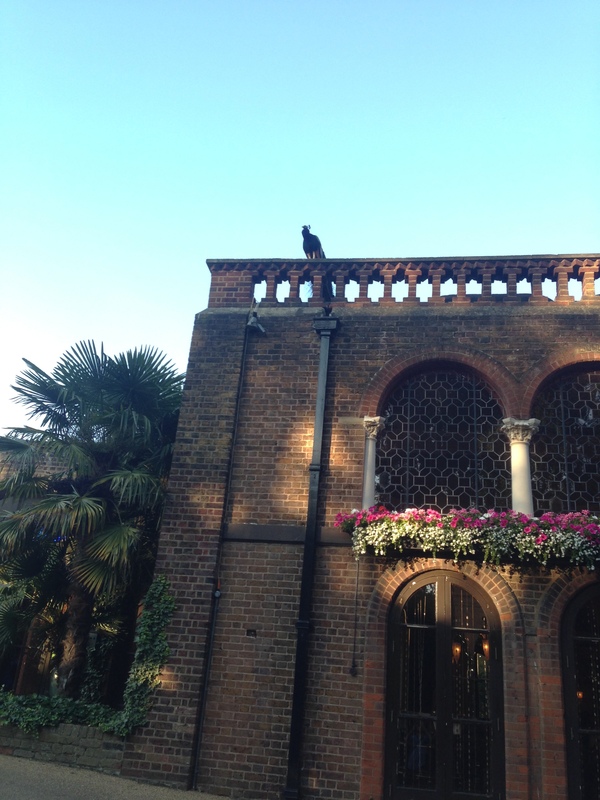 Holland Park is a lively, lush area surrounded by trees, plants and wildlife. 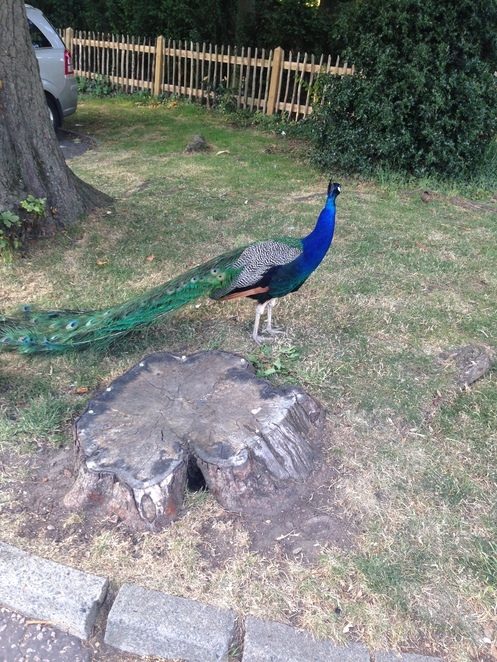 I enjoyed exploring the park and seeing peacocks for the very first time in my life; I will visit again. Why? A beautiful place to relax, explore and see peacocks up close.